Chuzzle: it's a non-stop explosion of game action. Chuzzles: well, they're adorable, cute, and cuddly. 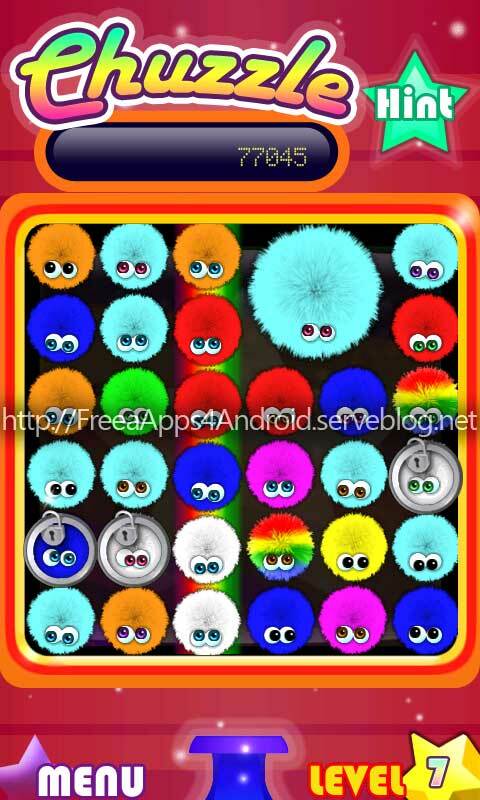 These googly-eyed little balls of fur giggle, squeak, and sneeze as you poke and push them across the grid. They're also explosive when they get together in a group of three or more. And there's only one way to make Chuzzels happy: pop 'em. Just slide, prod, and nudge the Chuzzles with a touch of the finger to match three or more (up and down, across, or both), and send fur flying and eyeballs bouncing. Once you start popping Chuzzles you might not be able to stop. Color-match the Giant Chuzzles, the Rainbow Chuzzels, and the Super Chuzzles for uproarious fur-flying fun and bonus scores. But watch out for Puzzle Locks and other ploys that can block your next move. Puzzle Locks freeze the row they appear in, making it really difficult to match nearby Chuzzles. Break free to boost your score with colorful cascades and combos. Every level offers three new patterns and more complex arrangements.